In a ceremony on March 10, seven Hollywood Area officers, killed in the line of duty, were recognized with a star on the Hollywood Walk of Fame. The Walk of Fame, created in 1958, features about 2,500 stars. "I can't think of a more fitting tribute to these fallen officers than to have their sacrifices memorialized at the entrance of the Walk of Fame." said Chief Bratton, who unveiled the Police Memoria Star with Hollywood Honorary Mayor Johnny Grant. "Everyone who visits this great tourist Mecca will be reminded that within the galaxy of Hollywood Stars there is a special constellation." The landmark, sponsored by the Hollywood Historic Trust, honors: Police Officer Charles Dean Heim (1994); Police Officer Joe Rios (1993); Detective Russell Lee Kuster (1990); Police Officer Robert Joseph Cote (1969); Police Officer Ian James Campbell (1963); Police Officer Clay Noble Hunt (1955); and Police Officer Clyde Pritchett (1936). 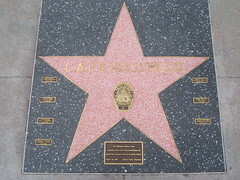 The star is located on a center island of Hollywood Boulevard and LaBrea Avenue and depicts the division's badge. Why were only seven officers recognized though? wow... that is so awesome to read and see the pix. how very touching that the entrance has this "special constellation"! The policemen that died in Hollywood had policeman badges,why does the police badge say police officer? Bill Cymbalsky said, "...The policemen that died in Hollywood had policeman badges,why does the police badge say police officer?" I think you know the answer, but I will state it anyway. At some point in LAPD's history, they changed the badge from "Policeman" to "Police Officer" in the wake of political correctness. It would not be PC to put anything other than the "Police Officer" badge on the Walk of Fame. There are "only" seven officers represented, as there have been seven Hollywood Division officers killed in the line of duty. And of the seven, Heim and Rios had "Police Officer" badges, and off-duty Detective Kuster had a "Detective" badge. The other four had "Policeman" on their badges. It was accuracy rather than "political correctness" that caused the badges to be changed in 1974, when female officers were allowed to apply for the same assignments as males. Both the former "Policeman" and "Policewoman" ranks and badges were replaced by "Police Officer." As a resident of another country and close neighbour, I want to congratulate the communication efforts of the LAPD. Communication and the way in which it is perceived, truly goes the distance in helping the general public better understand, what is truly, a difficult job. I can only hope that our own Law services here in Canada will take notice of such an inovative approach to "reaching out"
1- Why isn't there expanded police presence in the area of the grove to arrest these criminals? when they changed the wording on the badges from policeman to police officer, was that when you retired?